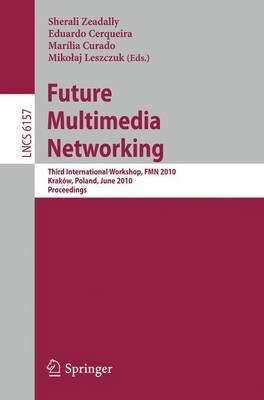 It is our great pleasure to welcome you to the Third International Workshop on Future Multimedia Networking(FMN). Followingprevioussuccessfulworkshops (held in Cardi?, Wales in 2008, and in Coimbra, Portugal in 2009), this year's workshopcontinuedthe traditionofbeingapremierforumthatgivesresearchers and practitioners a unique opportunity to share their experiences and discuss state-of-the-art research results and major recent accomplishments in the area of multimedia networking. In recent years, real-time multimedia services have contributedextensivelytoourlifeexperience. Thereisnodoubtthatmultimedia tra?c and services will continue to grow and will be signi?cant contributors to Internet tra?c in the future. The management of content distribution services and the e?cient delivery of real-time multimedia services over diverse and heterogeneous wired/wireless systems remain a signi?cant challenge for multimedia system designers and - velopers. This year'sworkshopfocused onvariousaspectsof multimedia systems including content networking,quality of experience/qualityof service, and video distribution. The call for papers attracted many outstanding submissions from allovertheworldforthemainworkshop. After arigorouspeerreviewofthes- mitted papers, the Program Committee accepted 36% of the submissions that cover a range of topics, including quality of service (QoS) and quality of ex- rience (QoE) management in content centric networks, video distribution, and video quality assessment in future multimedia networking environments. This year we also had a Demonstration Session on Future Multimedia Networking for which seven papers were accepted. It is our sincere hope that the proceedings of this workshop will serve as a valuable reference for multimedia researchers, designers, and developers. Putting together FMN 2010 was a team e?ort.